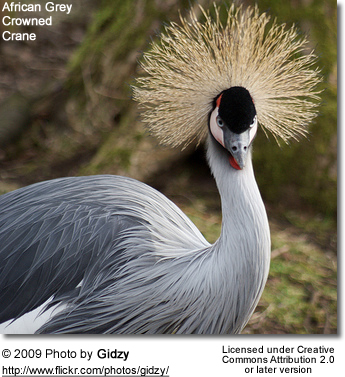 The Grey Crowned Crane (Balearica regulorum) is a bird in the crane family Gruidae. 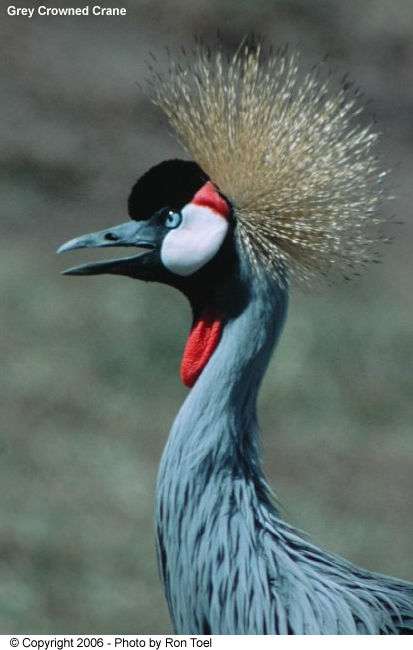 The Grey Crowned Crane is 116 cm tall and weighs 3.5 kg. Its body plumage is mainly grey. The wings are also predominantly white, but contain feathers with a range of colours. The head has a crown of stiff golden feathers. The sides of the face are white, and there is a bright red inflatable throat pouch. The bill is relatively short and grey, and the legs are black. Males and females look alike, although males tend to be slightly larger. Young birds are greyer than adults, with a feathered buff face. It occurs in dry savannah in Africa south of the Sahara, although it nests in somewhat wetter habitats. 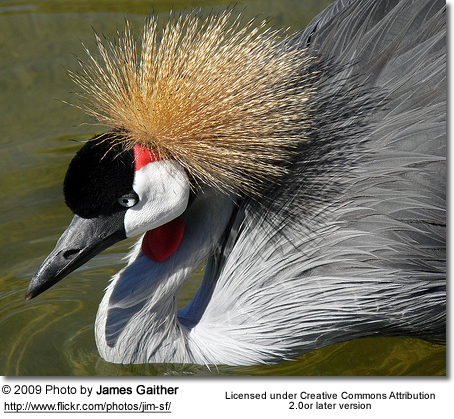 The South African Crowned Crane (Balearica regulorum regulorum) breeds from Angola south to South Africa. 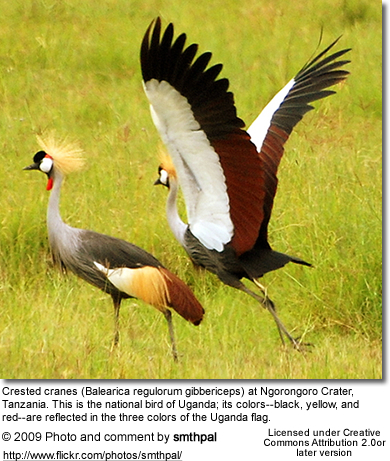 This species and the closely related Black Crowned Crane are the only cranes that can roost in trees, because of a long hind toe that can grasp branches. This habit, amongst other things, is a reason why the relatively small Balearica cranes are believed to closely resemble the ancestral members of the Gruidae. 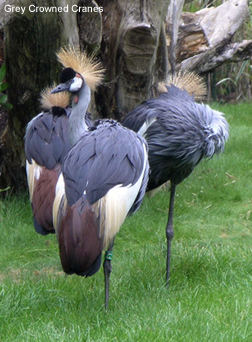 The Grey Crowned Crane has a breeding display involving dancing, bowing, and jumping. It has a booming call which involves inflation of the red gular sac. It also makes a honking sound quite different from the trumpeting of other crane species. Like all cranes, it feeds on insects, reptiles and small mammals. 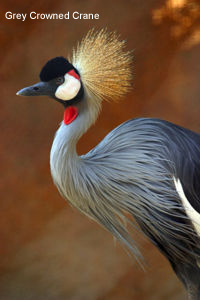 Although the Grey Crowned Crane remains common over much of its range, it faces threats to its habitat due to drainage, overgrazing, and pesticide pollution. 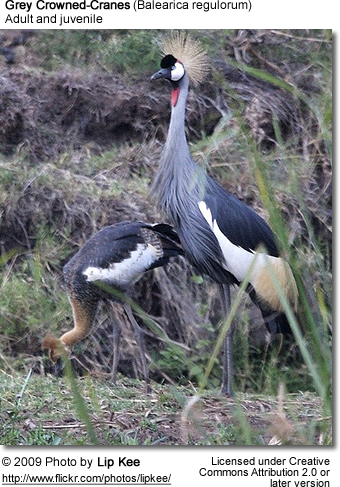 The Crested Crane is the national bird of Uganda and features in the country's flag and coat of arms.